We’d travelled a long way, and when we arrived in Rome, it was late, right in the middle of that strange hinterland where the kids flick from being wide awake and excited to worn-out zombies within a couple of seconds. Not feeding them properly helps to hasten the transformation, so we strode out into Trastevere in search of Dar Poeta, a pizzeria recommended by a couple of people in-the-know. It turned out that it was just that little bit further away than we’d thought, and just that little bit busier. Everybody was hungry, and we’d already spent a good deal of time wandering Trastevere, upside down map in hand, looking for the right place. Do we stake a claim on the list and stand around outside with the Romans, watching Italian Grandmothers zip through the narrow street on Vespas, inches from our toes, or do we give it up and look for somewhere else? Every parent has been in that spot…sometimes it pays off, sometimes it doesn’t. This time it did, and I’m glad we held our nerve. A couple of people higher in the queue gave up the wait seconds before their names were called. The waiter gave no-one a second chance, rattling through his list like a machine gun, so fast that I nearly missed the call, our very Yorkshire surname shouted out in a thick southern Italian accent. The aim of any restaurant is to serve as many people as possible, and the waiter’s list is the key to doing that, acting like a game of culinary Tetris, matching people with tables before they walk away somewhere else. Sometimes they do, sometimes a pessimistic half hour wait turns out to be much shorter. Sometimes, you’re just lucky. It’s not difficult to describe Dar Poeta. It looks just the same as every other Roman pizzeria – busy, bustling, noisy, tables crammed into simple and basic rooms wherever they fit, and often where they don’t, each one of them full with a mix of locals and tourists, the smell of wood burning in a huge oven somewhere near the back. There’s good reason the place is busy, and good reason it came recommended – the pizza is astonishing. 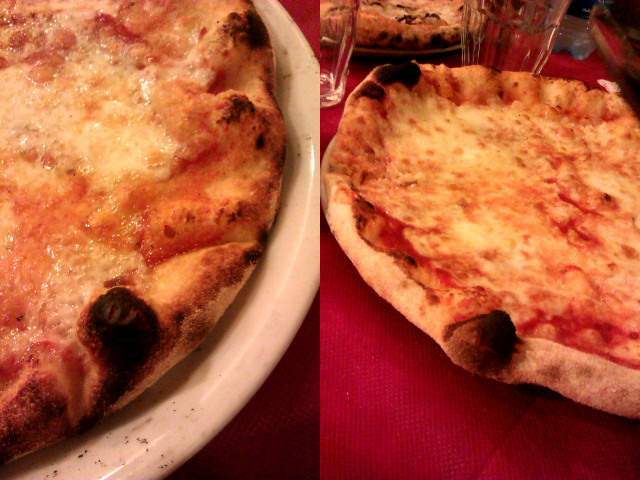 A first-night-in-Rome meal, late, demands no messing around, so four pizzas it was. I was expecting Dar Poeta’s pizza to be Roman style, which it was, and wasn’t. The base was slightly thicker than a true Roman pizza, which is traditionally very thin indeed, rolled flat right to the edges so that the crust crisps up and scorches. This was thin, but had a slightly thicker crust with more dough, softer round the edges. It was nowhere near a Neapolitan style, but a little removed from a traditional Roman pie. The authenticity or not of the pizza’s crust doesn’t matter one bit. It was outstanding, minimally topped with rich tomato and creamy mozzarella, along with whatever else the recipe demanded. Salami and chilli, in my case, for a pizza with a bit of a kick. Dar Poeta has got it spot on – its great value for money, the food is excellent and its in the most interesting part of Rome for wandering round in the evening, an area laced with narrow streets and dotted with beautiful squares. Trastevere is where the locals go out to eat, which is all the recommendation you should need. So, we walked back to the hotel happy and full. The youngest didn’t make it, and I ended up carrying her…a fair trade for half of her Margherita, I thought. Yummy!! I love a thin bubbly crust like that! !